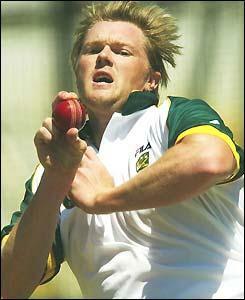 This article is dedicated to the former australian right hand fast bowler - Brad Williams. A well built pacer with good speed and control on cricket bowl led him into to National Team. Here is provided the profile, records and career of this player. Brad Williams is an Australian cricketer from Victoria. A very good built right arm fast bowler who has represented Australia in both Tests as well as in ODIs (One-Day Internationals). He started playing first class cricket in 1994-95 season for Victoria. Later he joined Western Australia Team in the Australian Domestic Circuit in 1999-2000, where he performs brilliantly. This led to his inclusion in the ODI National Team of the country. He played his first International Match in an ODI against New Zealand in early 2002. But his International career last only for two years, as he last played his International Match in an ODI Match against Zimbabwe. Though his bowling record in ODIs is good, but due to the presence of fast bowling trio of McGrath, Glesspie, Brett Lee, and some injury problems he was out of the team and unable to make comeback into the Team. Brad also has played in 4 Tests for Australia, but he was not as successful as he was in ODIs. His bowling average in Test Matches is just double to his ODI bowling average.